A superb phone for those in love with phablets - this is aesethetics combined with stellar performance at a decent price... just a shame the battery still suffers. I usually don't like to use the tired old refrain that Samsung copies a certain manufacturer's plans – but there's something familiar here. A brand releases a top-of-the-line phone, and then decides to make a phablet version by adding a 'Plus' to the end. That's precisely what Samsung's done here, and there's very little difference between the S6 Edge+ and the original Galaxy S6 Edge that debuted a few months before it. That's not necessarily a bad thing. Apple's seen some great success by bringing out a larger variant of it's normal phone - it's not sold in the same numbers, but it's given Apple fans that were getting a bit tired of having to compromise on screen something to pick up. Samsung clearly thought it could do the same thing - and even went as far as using the S6 Edge+ to replace the Note 5 in some territories, offering a phablet without the stylus. The price, understandably rose as well. Like the Note 5, the South Korean brand whacked a premium onto its phablet to allow for the larger battery and screen size, as well as a little bit extra in the RAM department. 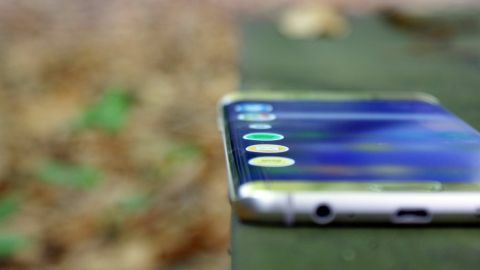 Since then Samsung has introduced the Galaxy S7 and a larger 5.5-inch Galaxy S7 Edge, which pushed the price down from its original £629/$959 to £579/$583. But then there was the Galaxy Note 7. That was a phone we rated four and a half stars - it was fantastic - but there was the issue of batteries which caught fire. You can no longer buy a Note 7, so if you want a larger Samsung the Galaxy S6 Edge Plus or the Galaxy S7 Edge are your only two choices. With the S7 Edge offering a phablet-like experience the S6 Edge+'s USP has been somewhat squashed, making it now a slightly more difficult sell. I can't help but love the curved side of the Samsung Galaxy Edge screens. While not as impacting as the Note Edge's single display from 2014, the fact everything melts into the side of the phone adds something that most other phones simply can't. It's a clever way of Samsung making a phone without bezels, in terms of appearance anyway, while maintaining the sides needed to hold the thing. The edges themselves are utterly redundant, despite what Samsung is trying to tell us, but in terms of pure aesthetics, this phone really has no equal. That's an area where the S7 Edge has an upper hand. Its edges are more curved, and Samsung's new TouchWiz interface for Android Marshmallow brings some genuinely useful features to it. The hope is the S6 Edge+ will also benefit when it finally receives the Marshmallow update. I'm actually surprised at the job the brand has done in terms of making the S6 Edge+ a decent phone to hold. The metallic rim is comfortable in the hand, and the smooth glass creates an effect that goes some way to offsetting the high cost of the phone. Despite packing a 5.7-inch screen, I was actually able to stretch my thumb right along the screen a lot more than I was expecting, again thanks to the curved display. It's still a phablet though, and as such you'll need to use a two-handed grip a lot more than with the normal S6 range. Design-wise though, Samsung's done phenomenally well again. Sure, it's just a larger version of the S6 Edge, but that's no bad thing. That phone was well-crafted, and the larger device doesn't add in any creaks or wobbles - it's solid in the hand, thin enough to not feel chunky and yet still has elements like dual wireless charging that add something extra to the mix. I suppose you could fault the camera protrusion, but given the quality of the snapper (more on that later, but it's worth checking out) I can't say I'd rather Samsung had made things flat just to preserve the look of the phone. Given a lot of people will be upgrading to this from the Samsung Galaxy Note 3, it won't feel like much of a hindrance.